Dr. Demir Murat Seyrek is an independent analyst on European affairs. Sabina-Maria Ciofu is policy advisor in the European Parliament. She writes in personal capacity. On 16 November, Victor-Viorel Ponta, the Social Democrat prime minister of Romania, suffered a massive defeat in the country’s presidential elections, losing by almost 10 percentage points to the right-wing candidate, Klaus Iohannis. Only three months earlier, one of Ponta’s political models, Recep Tayyip Erdo?an, was elected President of the Republic of Turkey, following more than 11 years as prime minister. They are supposed to represent opposing political ideologies, as Erdo?an’s party, AKP, is part of the European political family of Conservatives, while Ponta’s belongs to the European Social Democrats. Populism, however, doesn’t follow political colours, and their policies employed on a wide range of issues have been strikingly similar. Nevertheless, while following the Turkish president’s political recipe almost word for word, Ponta was decisively sanctioned by a recently awaken Romanian electorate, which turned out in huge numbers for the second round of the presidential vote. Over the last couple of years, the two have met repeatedly and have assured each other of mutual support. Ponta has offered “unconditional support” for Turkey’s EU aspirations, while Erdo?an often mentioned his long term commitment to Turkish investment in Romania. In the meantime, the political leadership of the two countries has often been criticised by the West for failing to uphold the most basic of European values, such as, inter alia, democracy, the rule of law and media freedom. First, both of them share a vision of power consolidation within and around a party-state. The discouragement of political pluralism through the centralisation of legislative and budgetary power has created ideologically-biased and identity-uncertain political constructions around the governments of both countries. For instance, Ponta has passed a government emergency ordinance – thus bypassing the parliament – providing for mayors’ inter-party migration, through the creation of a 45 day period where moving from one party to the other would be permitted. Given the high dependence of provincial mayors on governmental funds for developing local projects and the relatively low penetrating knowledge of how to attract European funds, this legislative move was a form of blackmailing the mayors into siding with the government. Similarly, in Turkey, Erdo?an has openly ensured support for AKP municipalities, while, at the same time, throttling – through central power instruments – the access of non-AKP municipalities to finance and administrative assistance. Additionally, he has created a number of mechanisms to prevent transparency and accountability of public finance spending, like, for instance, restrictions on the Turkish Court of Accounts’ audit mandate. Romania is often criticised at European and international level for its high-level corruption scandals and the politicisation of the rule of law. During his term as prime minister, Ponta has tried on a number of occasions to pass a law on amnesty, thus allowing the political power to overtake a judicial decision. Although it attracted significant public protests and international condemnation, Ponta has still refused to call on the Parliament to reject the law, when confronted to do so, during the final presidential debate. Fortunately, however, the law was abolished by the Romanian Parliament two days after Klaus Iohannis’ presidential victory, who has made freedom of justice and the rule of law his main campaign mottos. In Turkey, on the other hand, while the parliamentary investigation into corruption allegations against four ex-ministers continues, the court has banned media from reporting on this topic. Such a decision increases doubts over the transparency of the process, especially taking into account that Erdo?an has been very vocal in claiming that the corruption scandal is nothing more than a fabricated plot to unseat him. Moreover, both Erdo?an and Ponta have acknowledged the power of media ownership in their political endeavours. The media sector in Romania is highly politicised, and the two highest ranking media outlets, in terms of audience, Trustul Intact and Romania TV, have constantly disseminated highly biased information, favourable to Ponta and the Social Democrat party, ever since he became prime minister. Needless to say that the owner of one of these, Dan Voiculescu, is currently serving a prison sentence for corruption and the other one, Sebastian Ghita, also a frequent holiday partner for Ponta, is facing a number of corruption charges. Moreover, the governmental attempts to close down programmes critical to the government, such as Moise Guran’s Biziday on the public television channel, TVR, have been widely publicised. Similarly, Erdo?an has created favourable media outlets through businessmen close to AKP circles. These channels are frequently used for spreading partisan reports in support of all governmental policies, without questioning them. Additionally, there is constant pressure on other media outlets, with many senior journalists from mainstream media losing their jobs, as a consequence of being critical to Erdo?an, his party or his policies. Finally, the high number of imprisoned journalists in Turkey is a matter of great concern that has often been raised by the European Parliament and the European Commission in their reports on the country. When it comes to foreign policy choices, Ponta has yet again found a model in the Turkish president. On a recent visit to China, the Romanian prime minister was quoted as saying how much he admires the “great Communist Party of China”. Also, a fresh scandal of money-laundering of the Russian company, Lukoil, has brought along allegations of Ponta’s involvement with the judicial process. When it comes to the European Union or the United States’ position vis-a-vis the prime minister’s governing oddities, he seems both unhappy and irritated with such unwelcome involvement in his country’s politics. During the presidential campaign, he was quoted as saying “I don’t want to receive orders from abroad, we know better what to do here, in Romania.” From this perspective, Erdo?an is an equally unpredictable and unreliable partner for the West. His comments about Turkey’s willingness to join the Shangai Cooperation Organisation, as an alternative to the European Union, as well as his ongoing talks with the Chinese government regarding potential missile system contracts have often come as shocking news for EU and NATO partners. Notably, during their presidential campaigns, both Erdo?an and Ponta have used their religious faith, which happened to match that of the majority of their respective countries, as an argument for election. 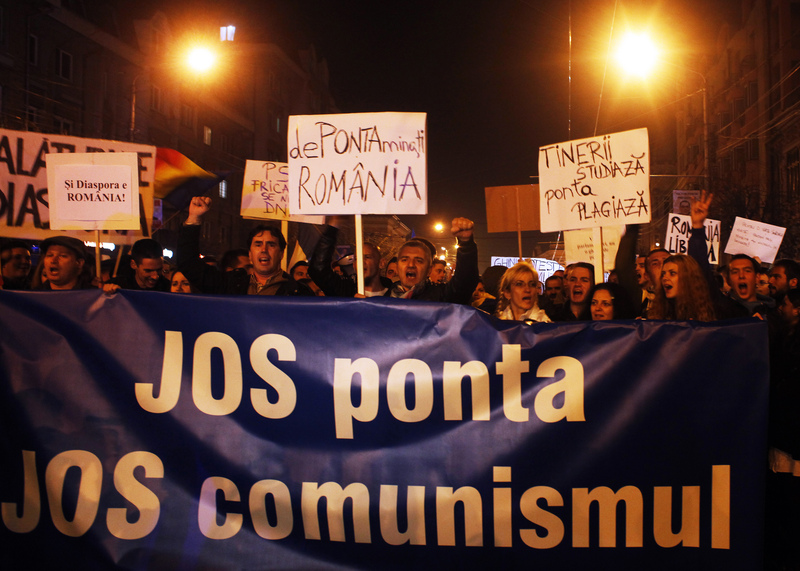 Given that he faced a counter-candidate from the German ethnic minority of Romania of Protestant background, Ponta has frequently made a point about his own Orthodoxy and his support for the Church, playing therefore on the Romania’s majority faith. Moreover, Gabriela Firea, the spokesperson for the Social Democrat Party and within Ponta’s close circle, has made comments about Klaus Iohannis’ lack of children as a matter disqualifiable for presidency. She was later sanctioned by the National Anti-Discrimination Council for her remarks. Strikingly similar, Erdo?an has been frequently attacking his counter-candidates based on their faith and families during the presidential campaign. He has often made offensive comments about the religious background of the leader of the Republican People’s Party. As for the leader of the other opposition party, the Nationalist Movement Party, his bachelor status and lack of children have become targets for Erdo?an’s discriminatory rhetoric. Although with a stagnating economy, an IMF deal, and, therefore, a much smaller national budget to play with, Ponta has adopted a similar view of social policy as Erdo?an had in Turkey. Building on the vulnerabilities of the poorest social categories in Romania, the prime minister has led a campaign of promises. Higher pensions will be coming the way of the elderly, and higher minimum salaries will ensure a decent standard of living for the others. Where from? He’s still to answer that in the new budgetary framework for 2015. It might indeed be that the big reason behind Erdo?an’s success has indeed been a booming Turkish economy that has given him the freedom of employing a wide range of economic and social policy tools for electoral gain. As a result of this, Erdo?an has become very popular with many segments of the society, particularly among people with lower economic status. Many of them believe that their improved socio-economic status, as well as their social recognition is a consequence of Erdo?an’s choice of policies. In conclusion, a number of significant political and policy issues have aligned the illiberal politics of the leaders in Ankara and Bucharest over the last couple of years. The young generation in both countries has protested in big numbers against their respective government, starting with the Gezi Park and Rosia Montana environmental movements, followed-up by large anti-government demonstrations throughout the countries and abroad. While Romanians have overturned all electoral results previsions, offering a surprise win to the right-wing candidate, Klaus Iohannis, with an enthusiastic popular vote and a dedicated diaspora vote, Turks may have to wait until the next round of elections to put the country back on its democratic track.